Hardware is included on the Price! Specially designed to slow down vehicle traffic. 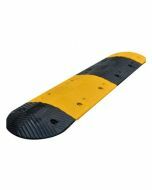 Bright yellow embedded EPDM rubber to improve visibility. Male and Female end cap available to create 360° transitions. Mounting screw included. Select below if you need them for asphalt or concrete. 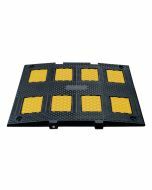 The 3’ heavy Duty Speed Hump is a top quality product that can slows traffic to 10-15 mph. 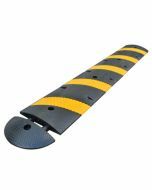 This is our wider speed hump model perfect to be located in any areas where a seep hump is needed, such as: parks, school zones, hospitals, and retirement communities. Excellent product to reduce vehicle traffic speed and increase safety, having a great feature of embedded yellow EPDM rubber for high visibility, the modular units lock together, creating a uniform surface fit any road size and width. Perfect for covering single and double lanes roads, It can be installed in asphalt or concrete grounds. Available with Male and Female end cap to create 360° transitions. It comes with 9 Mounting holes (1-1/8″D Countersink, 1/2″D ) for permanent installation on concrete or asphalt. Can be assemble very quickly and easy and by just once person, 5 years guarantee and our low price includes hardware.